It was around lunchtime in Regensburg and I'd bought some little open sandwiches from the bakery to eat as I gazed across the river at the medieval town centre. University students were lounging along the riverbanks, playing Frisbee, smooching and strumming on guitars. The light wasn’t really right for photos but, when I spotted this trio in the photos on the left, I couldn’t resist taking a snap. Unfortunately, it doesn’t capture the smell of cut summer grass and the rustle of leaves on the linden trees that day. 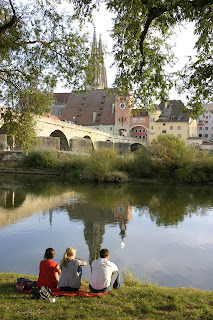 Regensburg is one of my all-time favourite destinations in Germany. It started life as a Roman outpost on the Danube and later became an important early missionary centre. In 1140, a stone bridge put it on the map and made it rich on trade between Germany and Italy; merchants had to go downstream all the way to Vienna before they found another river crossing. By 1245 it was a free imperial city fat on trade: the Dubai of its day, with the nouveaux-riches vying to erect the tallest skyscrapers. Twenty of these fortified towers remain, some of which reach 12 storeys. Above them soars a superb cathedral that demonstrates why the airy Gothic style was so revolutionary in its day. 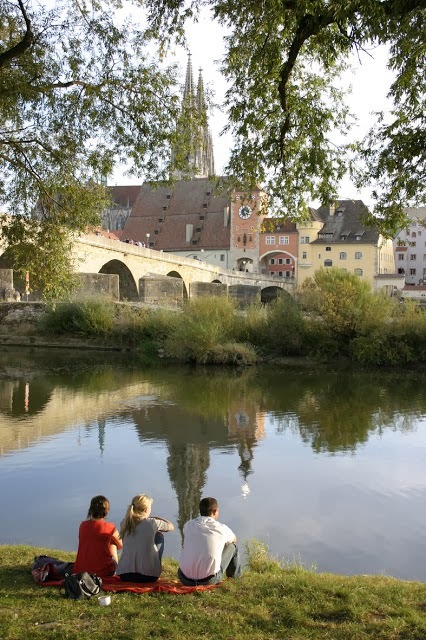 Regensburg has a notable university, so the town has a lot of student energy, while BMW and Siemens factories give the city a purpose beyond its historical assets. In the back streets around the train station, smoky workers’ eateries dish up dumplings and slabs of pork, and student beer halls and nightclubs are thick with a louche atmosphere. In the old town, alleyways are crammed with fashion boutiques and chic furniture stores. There seems to be a café every few steps: Regensburg claims more eateries and bars for its size than any other place in Germany. Buskers scrape away on the historic bridge, where couples often stop for a kiss. A fast-food kiosk nearby dishes up Regensburg sausage cooked over beech-wood charcoal and served with a slab of bread and sauerkraut. It’s just a saunter along the promenade from where most of the cruise ships tie up, and well worth visit. 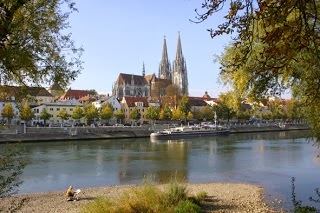 If you’ve been to Regensburg and feel you have something to add, please do so. Our readers appreciate your tips and memories.